We are prominent manufacturers and suppliers of Industrial Waste Incinerator. These systems effectively dispose of industrial wastes without polluting the environment. Their process involves little time making them highly fuel efficient. They have been manufactured using standard materials and have a long shelf life. They have been economically priced. Smoke and Fuel Gases from the primary chamber are directed to re burn the Smoke and Fuel Gases to ensure proper combustion in secondary chamber and consequently a complete smoke free operation so that there is no color or smoke in the chimney. It shall be designed to have a complete destruction of the flue gases. Where fresh air in induced to lower the temp. of the flue gases to avoid formation of the gases to enable heavier fly ash particle settle down. A Blower is provided for this application. We are prominent manufacturers and suppliers of Industrial Waste Incinerator. These systems effectively dispose of industrial wastes without polluting the environment. Their process involves little time making them highly fuel efficient. They have been manufactured using standard materials and have a long shelf life. They have been economically priced. Smoke and fuel gases from the primary chamber are directed to re burn the smoke and fuel gases to ensure proper combustion in secondary chamber and consequently a complete smoke free operation so that there is no colour or smoke in the chimney. It shall be designed to have a complete destruction of the flue gases. Where fresh air in induced to lower the temp. of the flue gases to avoid formation of the gases to enable heavier fly ash particle settle down. A blower is provided for this application. 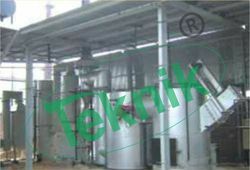 Looking for Industrial Waste Incinerator ?